2013 brought us a new corporate structure behind the scenes to everyone’s favorite Labor Day weekend tradition in downtown Atlanta, Georgia. That change brought only a minor tweak to the convention itself. It was no longer Dragon*Con with the two words linked together by an asterisk, but now simply just Dragon Con. While some of the social media sites and other easier to change media reflected that change for 2013’s Dragon Con, you for the most part still had a vast majority of the items and media related to Dragon Con displaying the older version of the name with the most common place to see it wherever the classic “Dragon*Con” logo was displayed in all its glory. Today, July 2, 2014, Dragon Con presented the geek world with a new logo for the event, the first in almost 20 years, after teasing an upcoming “unveiling” late last week. Here it is. I must admit, I’m a bit partial to seeing rougher edges in my designs. I’m more barbarian than sci-fi you might say. But the new design has its merits. The design is simple yet striking, with a color pallet that presents well. 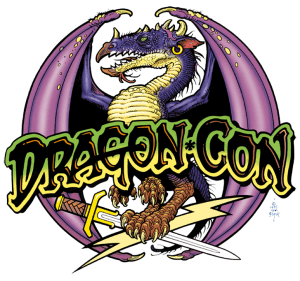 The gold on blue with red highlights is a classic mixture of colors for such things while the Dragon Con crest itself appears more modern in its presentation. Despite being bold, it’s also a minimalist design that should translate well to black and white and as imprints on merchandise, something that the older logo didn’t always do quite as well as this one should. It also reflects the growth of the convention and the changes over the years. The new design’s sleeker appearance certainly does that. The convention has grown much over its almost three decades of existence, and it has come to incorporate so many more aspects of fandom than it once did. How do you feel about the new logo? Which do you prefer? Let us know in the comments here and/or on Facebook! Stay tuned to Nerdy Minds Magazine on Facebook and @NerdyMindsMag on Twitter for more nerdy news, reviews, interviews, top 10s, etc! You can even subscribe to have each new post delivered straight to your inbox so you’re sure you don’t miss out; simply scroll to the bottom of the page (yes, all the way down) and opt in! You won’t regret it! …and if you do, you can always unsubscribe. But we’re not worried: we know you’ll like what you see! Want to write for us or think we should cover something specific? Take a look around to see if we’ve done it already…and if not, contact us here!